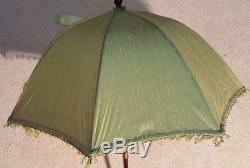 Deborah Lewis Vintage Style Umbrella Green San Francisco Folding Wooden Handle Beaded 100% Silk. 16 inches long - Folded. 32 inches long - Extended. Designed by Deborah Lewis San Francisco (Year of production is unkown). 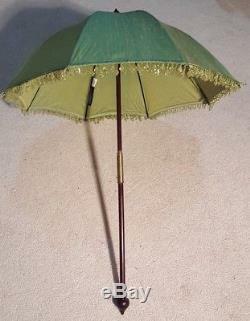 This beautiful vintage style umbrella is in great Gently Used Condition with no major flaws. Refer to the pictures for more condition info. The folding mechanism works perfectly. All the beading is intact, - none are missing. And silk, wood are in excellent conditions. Please use photos as part of description and zoom for more details. Most of my products have been bought at garage sales, yard sales, and estates sales. I know nothing about the original provenance, for that reason, I describe the product the best I can while adding photos that match description. Reasonable offers are considered, so please ask me! These items are clean and kept in smoke-free and pet-free environments. Please if you have any questions, feel free to contact me. Thank you for choosing my store and I hope that I can continue serving. 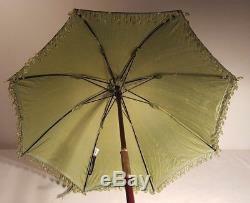 The item "Deborah Lewis VTG Style Umbrella Green San Francisco Folding Wooden Handle/ Silk" is in sale since Wednesday, March 14, 2018. This item is in the category "Clothing, Shoes & Accessories\Vintage\Vintage Accessories\Umbrellas & Parasols". The seller is "clau-vende-mas-17" and is located in Kennesaw, Georgia.